English Commons just reduced the period of the English Commons AU program to 5 weeks to provide more opportunities for students to earn 1 AU. In addition, by increasing the total number of class sessions available during spring and fall semester, students can earn 1AU much easier than ever!! 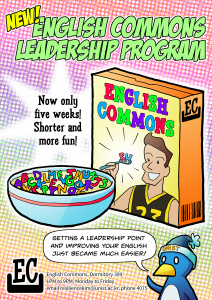 Here is a video that you can find more information about the English Commons AU program from. If you have any questions regarding the program, please feel free to contact me.